Halloween is a big deal. Americans are projected to spend more than ever on Halloween this year—reaching a record $9.1 billion. $3.4 billion alone will be spent on costumes. There’s nothing worse than showing up at a Halloween party wearing the same costume as four other people. You’re creative. You spent time and money planning the perfect outfit that hits all the right beats. But here you are, suddenly demoted to “Unicorn #3.” Sound familiar? If you want to stand out this Halloween, we at All Home Connections have your back. 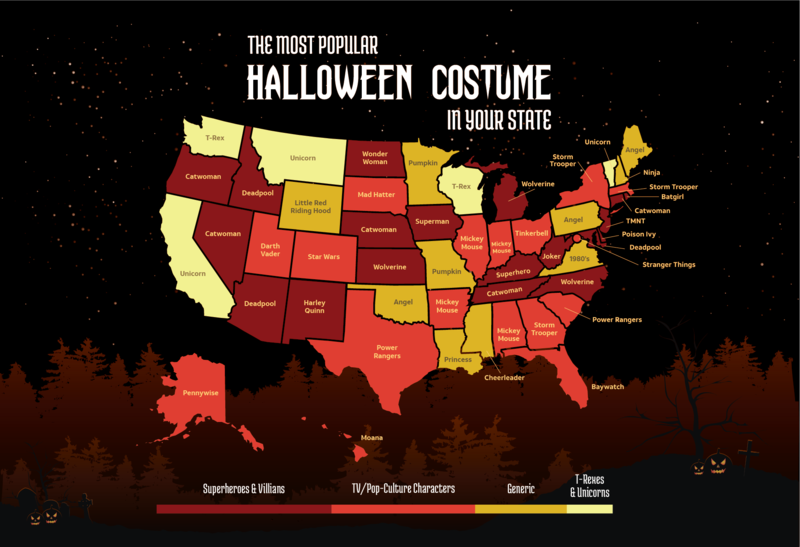 Using Google’s top Halloween costume list from 2017, we checked current Google Trends for a projected outcome of 2018’s most popular costumes per state. Now, you’ll know exactly what to expect on the streets trick-or-treating or at a party—and you can bet you won’t be caught dead looking like everyone else. We found that 38% of states have a superhero complex. Or some, like West Virginia, Delaware, and New Mexico, would rather play the villain. Catwoman is the clear favorite this year, with no less than five states opting to dress like her this Halloween. The wisecracking Deadpool comes in second, followed closely by Wolverine. One major change from last year is that you won’t see as many Harley Quinns running around. According to search trend data, Harley Quinn peaked as a Halloween costume with the debut of Suicide Squad in 2016. Her trademark pigtails and trusty baseball bat were everywhere. Since then, her popularity has waned. Although you might still catch Joker’s sidekick in New Mexico, other sightings will be few and far between. Pop culture will always bring new costume ideas to the table, and 16 states are opting to follow popular trends for their costumes this year. Pennywise from Stephen King’s It is predicted to make an appearance in Alaska, you’ll find Stranger Things characters in D.C., and quite a few Moana’s will be singing and sailing in Hawaii. 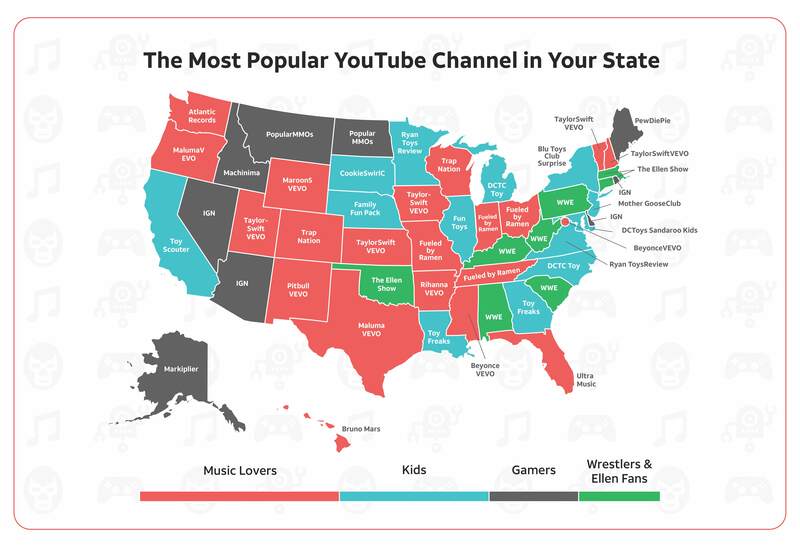 When it comes to Star Wars, we see that Georgia, Massachusetts, New York, and Utah have opted to join the dark side dressing as stormtroopers and Darth Vader, whereas Colorado is choosing more neutral territory (we hope the force is strong with them). Four states have opted to dress as Mickey Mouse, and several more as Power Rangers. There’s nothing wrong with reverting to the classics. That said, there are only so many pumpkins, angels, ninjas, and cheerleaders that should exist at a time. And this Halloween, you can expect to see quite a few of them roaming your favorite haunts. If you’re living in Virginia, steer clear of neon tights, blue eyeshadow, and zebra print. 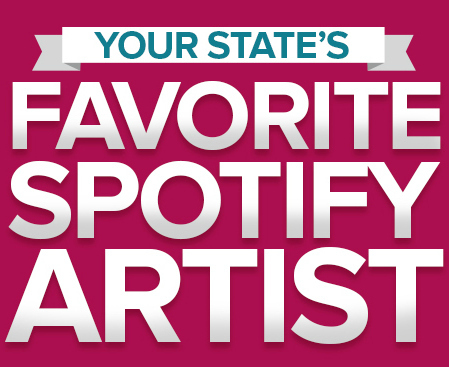 If you’re from Pennsylvania, Oklahoma, or Maine, we recommend you ditch the halos and don some devil horns instead. And residents of Missouri and Minnesota—we’re not saying your costume ideas weren’t thought out—but maybe let’s buy pumpkins, not BE pumpkins. We all have those generic, “meh” days, but Halloween is your time to shine! Don’t let it go to waste. People who don’t believe in unicorns have never partied in California, Montana, and Vermont—where you’ll be sure to spot at least a few this Halloween. We predict you’ll see magical herds of people with rainbow hair, sequins, and cute headbands, channeling positive vibes and drinking pink and blue milkshakes.If you haven’t seen those giant blow-up dinosaur costumes, this year you’ll be in for a treat. There will be quite a few T-Rexes charging around Washington and Wisconsin, enjoying complete, inflatable anonymity. Unless, of course, they have to drive somewhere—tiny arms can only get you so far. Just creepin’ it real—we know that Halloween costumes take a lot of effort. Some people even plan their ensemble months in advance. Take advantage of our list of the most popular Halloween costumes in your state, and treat yourself to the most original costume on the block.